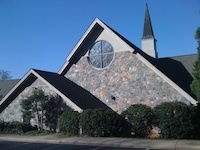 Stuart was called to serve as the Pastor/Head of Staff for Elkin Presbyterian Church in January of 2013. He was born and raised in Greenville, South Carolina where his parents were charter members of John Knox Presbyterian Church. Stuart graduated from Wake Forest University and Princeton Theological Seminary and was ordained in 1980. He has two daughters. Rachel just graduated from college and is doing a gap year of mission service. She plans to go to nursing school. Lilly has been traveling around the world since she graduated from college and is an aspiring artist, a free thinker, and a gifted writer like her mother. Stuart enjoys a daily exercise in the gym, hiking in the Blue Ridge Mountains, camping, reading, movies, dinner conversation, and researching his family history. Stuart is founder of Watershed Now, a 501 c3 here in Elkin dedicated to preserving our creeks and rivers, and he currently chairs the Peace and Justice task force for Salem Presbytery. Copyright 2013-Current Elkin Presbyterian Church. All rights reserved.